The Barcelona Port Authority has chosen IASO’s TW99 pergola as the winning design for providing outdoor cover at the various restaurants located in the port area. 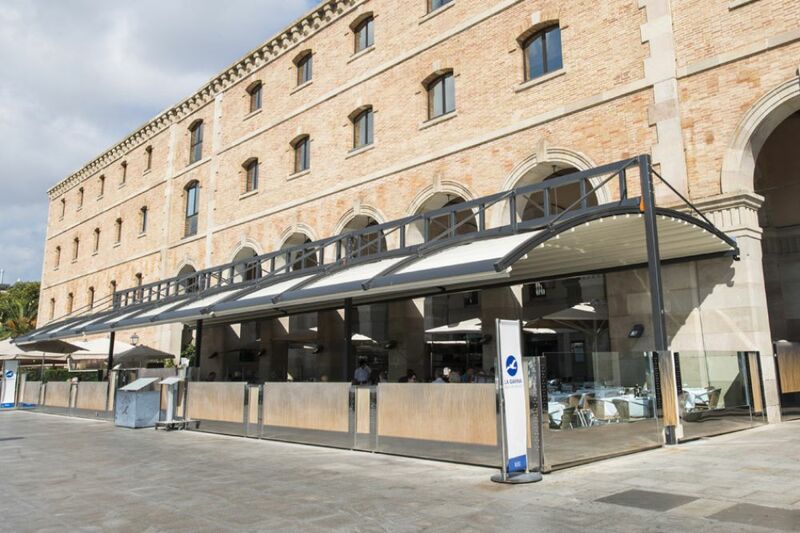 The first restaurant to install the pergola in the Catalan capital was La Gavina, which chose to modernize its outdoor area by replacing the white parasols that previously covered the terrace area. The pergola at La Gavina measures over 200 m² and is easily controlled by a motorized remote control. The retractable canopy allows the terrace to open up completely, giving a sensation of being outdoors. The front and back covers can be retracted whenever desired, giving the pergola a more light-weight appearance. The pergola is also visually appealing as the wiring is hidden inside columns, secured by concrete foundations designed to fit the dimensions. The protective aluminium enclosure can withstand gusts of wind of up to 100km/h and is perfectly adaptable to different weather conditions. The hanging double-sided pergola can be extended to a length of 8 m and can accommodate a one piece standard-width canvas of up to 10 m.
The TW99 pergola provides the perfect cover for any large space due to its excellent features and ease of use.